The Music Trust is delighted to announce the list of nominees for the 2017 Freedman Classical Fellowship. The annual Freedman Classical Fellowship, is designed to assist young top Australian classical musicians aged up to 30 years to build further career success. Based on an invite-only process, nominees are selected by senior industry figures in each state. Those nominated compile a project proposal and a recording, and from these, four finalists are selected to audition for the judging panel. The Freedman Classical Fellowship is funded by the Freedman Foundation, which assists talented young Australians in the arts and supports important medical and scientific research. The Fellowships for Classical Music and Jazz are managed by The Music Trust and administered by Sydney Improvised Music Association (SIMA). The 2017 nominees are: Tamara Kohler (flute), Matthew Kneale (Bassoon), Jaan Pallandi (double bass), Alex Raineri (piano), Thea Rossen (percussion), Phoebe Russell (double bass), Emily Sheppard (violin) and Katie Yap (viola). Tamara is a wondrous musician – inquisitive, technically brilliant and with an impeccable sense of the musical zeitgeist. Having grown up around indigenous musicians, most notably Deborah Cheetham, she is deeply aware of the transformative power of music. Her work with her ensemble ‘Rubik’s Collective’ is at the forefront of contemporary classical practice, having assembled a thrilling group of like-minded individuals who are generating much interest both in Victoria and nationally. She was recently chosen attend the 8th Blackbird Creative Lab in the US – a much sought-after position with one of the great chamber ensembles of our time. Matthew is a bassoonist and a founding member of both the Arcadia wind quintet and Ensemble Francaix. A passionate advocate for his instrument, he has attracted much attention for his vivacious performances. Matthew has a unique vision for the possibilities of the bassoon and the opportunities provided by the fellowship will serve as a mechanism for him to strategise the next steps to implement that vision. Jaan Pallandi to me represents the next generation of musicians who will lead the classical music industry. He is young, ambitious, very talented, professional, compassionate and strives to be the best he can be. He has expressed a keen desire to teach and share his knowledge with the future generation of musicians. Alex is not only an extraordinarily gifted pianist, but also possesses strong entrepreneurial and personal skills. He is highly intelligent and has artistic courage, daring to step “outside the square” with the projects he creates. I have no doubt that he has a huge career ahead of him, building on his already impressive achievements to date. I feel he is highly deserving of this award. Ever since I heard her successful audition into ANAM as a 16 year old, I have been moved and extremely impressed by her extraordinary technical and musical achievements as a double bassist. Her natural flair for her instrument is rare indeed and her dedication towards it become a solo instrument of extreme seriousness deserves great recognition. It is exceptionally rare to find a talent like Phoebe Russell. Thea is an exceptional young percussionist – an accomplished performer who is constantly seeking opportunities to push the boundaries of the art form. Most importantly, she is highly personable, an excellent and open collaborator and a role model for other young musicians. Emily is a strong candidate with a wonderful musical maturity and outstanding technical proficiency. She is interested in many different styles of music, and is a champion for contemporary Australian music in particular which she has a particular affinity for. She is a hard working professional with a lovely character. I have chosen Katie Yap as a candidate because she is not only an excellent musician, both in chamber music and solo capacity, but is, since finishing at ANAM, she has proved herself as a hard working professional with a good attitude and an appetite to explore many different types of music. Frank Celata is the Artistic Director of the Australian International Symphony Orchestra Institute (AISOI), and Lecturer in Clarinet at the Sydney Conservatorium of Music. Paul Dean is Senior Lecturer of Clarinet and Head of Woodwind at the Queensland Conservatorium. Julia Fredersdorff is a member of Van Diemens Band, a Tasmanian chamber orchestra dedicated to music of the 17th and 18th centuries, and teacher of baroque violin at the Conservatorium of Tasmania. 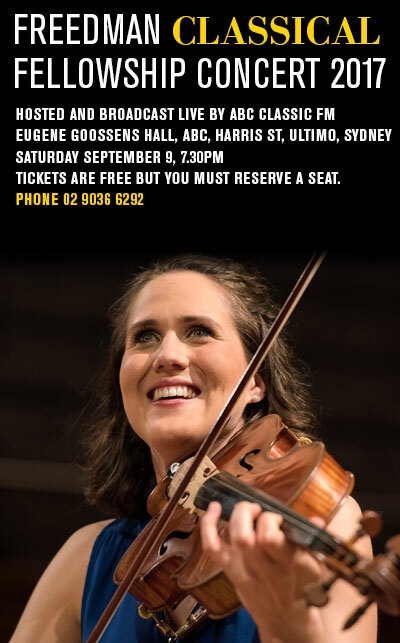 Zoe Knighton is a founding member of Flinders Quartet, one of Australia’s finest chamber ensembles.